Polar Seas, the waters surrounding the north and south poles. This is properly only the termination of the Atlantic, and is bounded by the northern coasts of America, Europe, and Asia. The Arctic circle includes nearly the whole basin with the exception of some of the border seas, such as Hudson bay and a part of the White sea. It communicates with the Pacific through Behring strait, and with the Atlantic through Davis strait, besides its wide connection between Greenland and Norway. (See Arctic Discovery.) In its known parts islands are numerous and some of them are large. N. of America they form an archipelago; N of Europe are Spitzbergen, the newly discovered Francis Joseph Land, and Nova Zembla; N. of Asia the New Siberian islands and the imperfectly known Wrangel Land. There are probably more in the unexplored central region, as land has been seen to the northward of the furthest points reached by the American and Austrian expeditions; but the absence of icebergs from the drift ice N. of Spitzbergen indicates the absence in that direction of land extensive enough to support glaciers. There are border seas and bays of considerable size, forming dependencies of the Arctic ocean, such as the White sea, the Kara sea, the gulf of Obi, Hudson bay, and Baffin bay. The drainage of N. E. Europe, the whole of N. Asia, and a large portion of North America is poured into the arctic basin by rivers of considerable size and length. 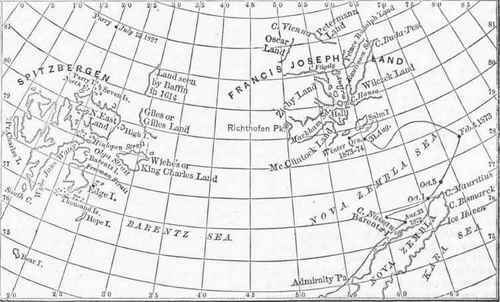 - The unexplored part of this sea is about as large as the continent of Australia; as the ice is the only impediment to navigation in it, a knowledge of its different stages and of the names they have received is of importance. Icebergs are the largest masses, which on account of the slowness of their melting descend furthest toward the equator. They are all formed on land in the shape of glaciers. (See Glacier.) Of these the largest have been observed in Greenland, where they cover a great part of the interior, and abut on the sea either by arms descending into the bays or fiords, or by a bold front many miles in extent, as in the Humboldt glacier in Smith sound. If the glacier terminates on a cliff fronting the sea, large masses of ice gradually overhang and finally break off by their own weight; but if the shore is low and the end of the glacier dips into the sea, it will push its front part forward until it reaches water deep enough to float the mass, which is then broken off by the force of buoyancy. The process of breaking off has been called by the whalers "calving." The icebergs are then carried away by the current, and by irregular melting are made to assume the most fanciful forms. Being originally formed by snow, the ice is perfectly fresh, and it is often melted down by navigators to renew their water supply. The sea water freezes in winter to the depth of 6 to 10 ft., and when it breaks up it forms ice fields, often many miles in extent. Smaller ice fields are called floes. By collision the edges of fields and floes become broken and piled up into hummocks. Fields and floes much broken up, partly open and partly refrozen, are called the pack. Drift ice and brash ice are parts of the pack scattered and in motion, the latter term being used when the pieces are much reduced. A margin of ice which adheres to the shores and is formed by the tides is called the ice belt or ice foot. Navigators can judge of the extent of ice beyond the horizon by a peculiar glistening of the atmosphere known as the ice blink; over open water the sky looks dark and is known as water sky. - The nearest approaches to the pole have been made N. of Spitzbergen by-Parry, through Smith sound by Kane, Hayes, and Hall, and to the east of Spitzbergen by the Austrian expedition under Payer and Wey-precht. The distances from the pole reached through these three routes do not differ materially, being all between 400 and 500 nautical miles. In these parts the ice breaks up in summer and moves S., thus opening irregular channels through which it is possible to penetrate more or less easily, according to the season. The question of an open polar sea has received much attention of late years; it was first advocated by the Russian explorers, Wran-gel, Middendorff, and others, who had observed a band of open water N. of the New Siberian islands, to which they gave the name of Polynia. This is probably due to a current of warmer water passing from the Atlantic toward Behring strait. The American expeditions found open water at the N. end of Kennedy channel, and the tides have been supposed to indicate a free communication with the Pacific in the direction of Behring strait; but this is very doubtful, as in all known instances the tide wave is promptly extinguished after passing through a narrow strait into a wide basin. Borgen, in discussing the results of the second German expedition, calculates that, supposing the whole polar sea to be frozen over in winter, about one third of the ice is carried off in summer by drifting and melting; but he thinks that the uncovered surface consists of irregular and constantly changing openings in the ice, not necessarily communicating with one another. The question will only be fully solved by actual exploration. - The currents are very important, as determining the limits of the drift ice. The different theories on the subject of the northern extension of the Gulf stream are set forth in the article Atlantic Ocean. Its observed effects are briefly these: The warm water, crossing the Atlantic diagonally, passes the North cape and strikes the western and northern parts of Nova Zembla, where it occasionally leaves proofs of its origin in the shape of bamboos and tropical seeds. Further E. observations are still wanting, but it is probable that the open water, the Polynia of the Russians, is still due to the same cause. A return current from E. to W. has been observed by the Aus-trians along the S. coast of Francis Joseph Land, which probably merges in the cold current descending along the E. coast of Spitzbergen. On the W. of that island a warmer current sets N. The S. and E. coasts of Iceland also receive warm water from the south. Along the E. coast of Greenland a cold current sets S. and turns around Cape Farewell into Davis * strait, which it follows up some distance, finally turning and merging in the Labrador current, which flows S. on the opposite side of the strait, and which after passing the banks of Newfoundland partly disappears under the Gulf stream and partly flows S. along the coast of the United States. A cold current flows out of Behring strait into the sea of the same name. In conformity with the temperature of these currents, the Arctic ocean is found almost free of ice along the N. coast of Europe as far as the northern part of Nova Zembla and the Kara sea. On the E. coast of Spitzbergen it is so thick as to be generally impenetrable; on the "W. coast it is very loose, or even absent, in summer. Along the E. coast of Greenland the pack is so thick that ships can rarely reach the land, though some navigators suppose that further N. it forms only a barrier in summer, with comparatively open water beyond. In Davis strait drift ice and icebergs are very abundant on the Labrador side, and are carried in spring and summer over the banks of Newfoundland, sometimes as far S. as lat. 40°. The Beh-ring strait current carries ice as far as the Aleutian islands. Although water communication is known to exist through the various channels in the North American archipelago, they are so obstructed by ice that no vessel has yet penetrated from sea to sea through the famous northwest passage; the ice, though in motion, becomes gorged in the narrower parts. - Temperature observations show that in winter there are two poles or regions of greatest cold, the one among the islands north of America, the other in northern Siberia. The milder region between the two, about the earth's pole, would thus appear to be chiefly occupied by water. In summer this middle part is the coolest, on account of the greater accumulation of ice and the greater absorption of the sun's heat by the land. "Wherever observations have been made in winter, calm days have been found to exceed in number the windy days, and to be accompanied by clear weather and greater cold. Wind from any quarter raised the temperature and brought clouds and snow. To the traveller the impression is the reverse, as a greater degree of cold is more endurable in a calm than a lesser when the air is in motion. - The arctic lands and seas support a considerable number of animals, which furnish man with food, clothing, and fuel. On land the reindeer, the arctic fox, the arctic hare, and the lemming are found in the northern parts of all the continents and adjacent islands, and even on islands so isolated as Spitzbergen. The musk ox is confined to the American polar regions, including Greenland. The polar bear, although found also on land, is more generally found on the ice where he can capture the seal, his ordinary prey. Of the latter several species are found, and together with the walrus form the object of a lucrative pursuit, expeditions being fitted out in Newfoundland and the ports of northern Europe. Numerous cetaceans inhabit the water, of which the narwhal is the most peculiar. The right whale was formerly found in great abundance in the Greenland seas and inside of Behring strait, but indiscriminate persecution has reduced the number so that its pursuit has almost ceased to be profitable. Aquatic birds frequent the polar seas in summer in immense numbers, for the purpose of breeding. Fish is found everywhere, but not of a size or in quantities sufficient to be an article of commerce; of late, however, Norwegian fishermen have paid some attention to and derived profit from the capture of the arctic shark off the N. E. coast of Lapland and near Bear island. The lower animals, crustaceans, mollusks, and radiates, are represented by fewer species than in warmer seas, but in compensation the number of individuals is very large, and even in great depths the dredge finds undiminished numbers. - Recent Explorations. The scientific and exploring expeditions which from time to time have been made into the Arctic ocean are traced to a late period in the article Arctic Discovery, and in the biographies of the various explorers there referred to. That article brings the history of arctic exploration down to the unfortunate expedition of the American Captain Hall (1871-'3), described in still further detail in the article Hall, Charles Francis. The history of arctic exploration since that expedition will be briefly given here. The year 1872 began with several minor expeditions, generally undertaken at private cost, and each contributing, though in minor matters only, to a knowledge of the best paths to be pursued in more important undertakings. They were nearly all carried out by seamen of northern Europe. Thus in the early summer Capt. Altmann, a Swede, sailed his yacht, the Elvine Dorothea, along the entire E. coast of Spitzbergen, found the sea free from ice, and visited Wiche's Land or King Charles Land. Capt. Nils Johnsen (of Tromso), in the Lydiana, and Capt. Johannes Nilsen, in the Freia, also landed in this long unvisited region in the summer of 1872. All these, by their reports of the freedom of the passage from ice, contributed to the growing opinion in favor of an eastern path to more northern latitudes. Dr. Leigh Smith, an English savant, spent a part of the summer in scientific investigation of the seas N. of Europe, and Capt. David Gray cruised for some time off the E. coast of Greenland. Later in the year the Norwegians Capt. Jensen and Svend Foyn, the latter a well known whaler, undertook expeditions, but without noteworthy result. The Norwegian government also sent out a winter expedition to Spitzbergen, hoping to relieve 17 Norwegian sailors who were known to be cut off there by the ice; but the vessel was driven back by the severity of the weather. A private expedition followed, with like result. On Jan. 28, 1873, Herr Rosenthal of Bremerhaven, well known for his efforts in this direction (see Aectic Discovery, vol. i., p. 680), sent out a steamer for Spitzbergen with the same object, but, like the Norwegians, without success. In June, 1873, when the island was reached by Capts. Tellefsen and Mack, the 17 men were found to have died of starvation. - While these minor expeditions were in progress, a party had been organized in Sweden to spend the winter on Spitzbergen, in order to begin from that point a sledge expedition toward the pole. The steamers Polhem and Onkel Adam, and the brig Gladan, with Prof. Nordenskjold, the leader of the expedition, Capt. Palander, Drs. Erwall and Wijkander, and others, and a large crew, arrived at Green Harbor, on the W. coast of Spitzbergen, Aug. 4, 1872. Being unable to carry out the original plan of establishing winter quarters on Parry island, further N., the expedition established itself at Mussel bay, lat. 79° 50' N. It had been intended that the Gladan and Onkel Adam should return at once to Sweden, leaving but 21 men in all for the winter; but before they could make their escape all three vessels were shut in the ice, and 67 men found themselves left with provisions and other necessaries for only 21. Another misfortune followed. Their reindeer, brought to draw the sledges northward, escaped from their keepers, and thus the objects of the expedition were rendered impossible. After successfully withstanding the severity of the winter, by dint of great care and prudence in the use of their provisions, the explorers found themselves compelled to abandon their project, and returned in the summer of 1873. - Payer and Weyprecht, the very successful Austrian arctic explorers (see Aeotio Discov-eet, vol. i., p. 680), after returning from their journey of 1871, had undertaken, with the aid of liberal subscriptions and appropriations, to make a further exploration. According to their instructions they were simply to visit the seas N. of Siberia, and thoroughly explore them. As it turned out, they were led to widely different results. A vessel, the Tegetthoff, was built especially for the expedition, and fitted with every appliance which experience could suggest. The final arrangements were made at Tromso, and the expedition sailed thence on July 14, 1872. Count Wilczek, an influential Austrian, one of the chief supporters of the plan, in the yacht Isbjorn, started a little earlier toward Spitzbergen to establish a provision depot; and after reaching that island and going to Nova Zembla, he joined the Tegetthoff, which had pursued a more direct course, on Aug. 12. On the 21st, however, the Isbjorn took leave of her more important companion, and returned to the south. For more than a year nothing was heard of the Tegetthoff, and great anxiety prevailed throughout Europe as to her fate. Directions were given to northward-bound whalers to search for her; and a relief expedition had been proposed in Russia, when suddenly, on Sept. 3, 1874, the party of the Tegetthoff were brought safely into Wardo, Norway, by the Russian schooner Nikolai. On the very day of her parting from the Isbjorn the Tegetthoff had been caught in the ice (only temporarily, as her crew then supposed) N. W. of Cape Nassau, in lat. 76° 30' N. Every effort to set her free proved vain. The ice closed round her in a solid mass, which no storms sufficed to break up, and the pressure "forced her up upon the floe and nearly destroyed her hull. This continued during the whole winter, and the position of the ship varied as the winds and currents moved the ice field; but the direction of this was generally northward, and into regions which the expedition might not have reached by other means. On Aug. 31, 1873, they saw high land to the northward, and their observations soon revealed to them an island or continent hitherto unknown. Late in October they landed upon it in lat. 79° 54' N., between Ion. 55° and 60° E., at a point which they called Wilczek island. The whole body was named Francis Joseph Land, after the Austrian emperor, and in the arctic night which succeeded they explored it for some distance inland. On the reappearance of daylight, Feb. 24, 1874, Payer undertook three sledge journeys, in the second of which he reached a little beyond the 82d parallel of latitude. The new region, so far as explored, consisted of a wild and mountainous country, with peaks more than 2,500 ft. high, several of which Payer ascended, and with enormous and picturesque glaciers, the whole nearly surrounding an extensive sound (Austria sound), dotted with islands. The E. coast of this was named Wilczek Land, the W. coast Zichy Land, and the region at the head of the sound Crown Prince Rudolph Land. The furthest point attained by him, lat. 82° 5' N., Payer called Cape Fligely; he reached it on April 12, and saw from it another sound still further N., and other mountains about it. A far-off promontory of this mountainous shore, which was plainly visible, was named Cape Vienna, and the furthest land to be seen was called, in gratitude to the great German geographer, Petermann Land. The third sledge journey was toward the west, and during it Payer saw the highest peak discovered, Mt. Richthofen, about 5,000 ft. high. After the return from this journey, the party abandoned the Tegetthoff and journeyed to the south for 96 days by sledges and boats, over the ice and water. On Aug. 18, 1874, after much suffering, they sighted the Admiralty peninsula of Nova Zembla, and six days later discovered the Russian schooner Nikolai, by which they were at once taken up and carried to Wardo. From this point to Vienna they were everywhere greeted with great rejoicings. This expedition is the most important of those undertaken in the last decade. Its results had a great effect upon the discussion of the problem of reaching the pole, and upon the question of an open polar sea, and everywhere directed the attention of scientific men and governments again to arctic discovery. - Shortly after Payer and Weyprecht's return, a new expedition was resolved upon by the British government. Two ships were placed in the dockyards to be fitted up for the explorers, and Capt. Nares of the British navy, who commanded the scientific cruise of the Challenger, was assigned to their command. The Alert and the Discovery (formerly the Bloodhound) were the vessels selected, and the expedition sailed on May 29, 1875. The following brief abstract of the instructions has been published: The Alert and the Discovery are to push up Smith sound as far as practicable during the coming season. The Discovery is to find winter quarters somewhere within Smith sound, and at such a distance from the entrance that it may be within reach of a third ship, which is to sail in 1877 if necessary, and form a depot somewhere near the mouth of the sound. The Alert is, if possible, to push on to some point further N., but not to winter at a greater distance than 200 m. from her consort. In the spring of 1876 the sledging expedition for the north pole will be sent out, and subsidiary expeditions be made for the exploration of the coast. Success in the spring of 1876 might enable the expedition to return in the course of that autumn; but a second winter, and even another season of exploration, may become necfessary. If it should appear impossible to extricate the ships from the ice in the summer of 1877, one or both would probably be abandoned, and the crews would fall back upon the relief ship to be sent out to the entrance of Smith sound. - For an excellent and detailed account of polar exploration since 1871, see Lie Polarforschung der Gegenwart, by Friedrieh von Hellwald, in the Deutsche Rundschau for November, 1874. The royal geographical society has fixed the limits of the Antarctic ocean arbitrarily at the south polar circle, which corresponds nearly with the average limit of the pack ice. Other limits based on isothermal conditions of the sea have been proposed, but observations are not yet sufficient in number to give satisfactory results. Much less is known of this sea than of the north polar sea, the totally unexplored regions in the two bearing the proportion of nearly three to one. Navigators who have penetrated into the ice are few, and the highest point reached by Sir James 0. Ross falls far short of the latitude reached by many of the northern expeditions. (See Antarctic Discovery.) Our older maps showed in this region an imaginary antarctic continent, which the progress of discovery has tended to diminish continually; we are still much in the dark with regard to the extent of the land seen, and much acrimonious discussion has taken place between the American, English, and French discoverers. The discrepancies could probably be reconciled in a great measure by assuming that much of the land seen consisted of islands of no great extent, which have been erroneously assumed to be parts of a continuous coast. Victoria Land, discovered by Ross, is probably the largest island actually seen; mountains of 12,000 to 15,000 ft. were seen on it, the southernmost being the volcanoes Erebus and Terror. The ice pack is encountered between lat. 60° and 70°, and was supposed by Oapt. Cook, who first saw it, to be impenetrable. But his successors since the time of Bellingshausen have found that during the southern summer it is in motion toward the north, and that after penetrating it large spaces of open water are found, at times so extensive that no ice is in sight from the masthead. Capt Ross, after penetrating to lat. 78° 10', was stopped by a high barrier of apparently stationary ice. From all accounts, the antarctic ice seems to be much heavier and thicker than that at the north pole, but of its mode of formation we know but little. Immense fields are described with a flat surface, but terminated by vertical cliffs, generally about 150 ft. high, quite different from anything observed at the north. The ice drifts to the north further in the southern summer than in winter. According to Fitz Roy, who has collected a large number of observations of drift ice, it is found in greatest abundance and further toward the equator in January than in any other month. The average limits.for the whole year within which drift ice and bergs are encountered with tolerable certainty are 45° S. in the middle and E. part of the Atlantic and the TV. part of the Indian ocean, 54° in the middle part of the Pacific, 58° off Cape Horn, and 60° in the central part of the Indian ocean and TV. part of the Pacific, or between the meridians of 70° E. and 170° TV. "With- regard to quantity, it appears that it is least in the seas S. of Australia and New Zealand, and greatest in the eastern Atlantic and western Indian ocean; but this result may be affected by the greater number of observations on record for the latter region. The extreme lowest latitudes at which drift ice .has been encountered are 34° S. in the Atlantic and 40° in the Pacific. The influence of ocean currents is very plainly exhibited in the outline of the limits of drift ice. Thus at the S. extremity of America the Cape Horn current, joined to the Brazilian and La Plata currents, repels the ice toward the east, keeping it off the Falkland islands; but east of these the antarctic current carries it far into the Atlantic. At the cape of Good Hope the ice is carried into a point toward its TV. end by the same current which here gives off the South African current. But immediately E. of the cape the united Mozambique and Madagascar warm currents repel the ice considerably further S. Again, S. of Australia and New Zealand the combined S. and E. Australian currents form a deep bend in the limiting line of the drift ice. Deep-sea temperatures were taken by Sir James C. Ross, but with thermometers exposed to pressure and therefore not as trustworthy as the more recent though less numerous ones of the Challenger expedition, which gave 28° to 29° at the surface (32° near the pack), 29° at a depth of 40 to 300 fathoms, and below that 33° to 34°. This warmer stratum prevented the obtaining of the true temperature at the bottom. With regard to the climate, observations, deficient as they are, still point conclusively to the fact that the winters are milder and the summers cooler than in the north polar regions, thus indicating a more maritime climate caused by a less amount of land. No land mammals are known to inhabit the islands of the far south, thus contrasting with the north polar regions, where large and numerous animals have been observed almost as far north as man has penetrated. But the sea is inhabited by numerous seals and cetaceans, and birds, particularly penguins, have been found in astonishing numbers. Fishes and lower animals must of course abound correspondingly.